With Henry Gilbey and I continuing to make plans for our Co-Guided trips in the Autumn, I invited him up to south Devon for the day so that he could capture some footage that we hope to use as part of our marketing. With three clients to guide, the day itself was one of the sunniest and hottest of the year so far. And with a screaming easterly wind to boot, it made mark selection absolutely critical to our chances of success. All three were returning clients which was very pleasing. Additionally they were very mobile individuals (just as well considering the initial walk required to the marks) and they were well kitted out with modern lure gear, breathable waders, hats and sunglasses. So with copious amounts of sun-cream applied and fluids loaded into our rucksacks we departed from the car-park whereby a 2 mile hike ensued. Why so far? Well, each mark after the first would see us moving back towards the car, and I was confident that even though the first two marks were very remote, that they would yield a bass or a wrasse – something Henry was keen to experience, as it possibly offers prospective clients something different if the bass just aren’t playing. The first mark is a large slab of exposed headland where arguably 20 lure anglers could fish, let alone 3. The water here is actually fairly shallow at low tide (5 – 10 ft) and the current is spectacular once the tide really starts to ebb or flood. Additionally, the attraction and subsequent success that I have enjoyed on this mark is (I believe) due to the underwater weedy ledges that run parallel to the main body of rock – the bass appear to swim (with the current) very close to them. A month or so ago, Josh and Adam enjoyed a guided session with me in similar conditions. On that day, Josh was very unlucky when a decent bass swirled at his surface lure a couple of metres from where he was stood… Well guess what – the same thing happened again as a shout (expletive) from him signalled that a bass had ‘come up’ from the depths to take a good look at the lure right in front of him… Pity. The next mark is an area of water separated from the main body of water – at least until around the ‘half-tide’ mark when the sea and the fish (wrasse and bass) tend to enter or depart on the flood or ebb. It dries out completely at low water and is essentially a large (football pitch size) ‘bowl’ therefore, I was able to point the area out on the walk to first mark, along with another couple of successful venues. There are a number of slightly higher platforms that allow comfortable access here but I needed to watch the tide closely, as by now it was steaming in. I would’ve loved to asked my clients to utilise weightless weedless senkos here such as the DoLive Stick (they’ve been very effective here) but the wind was really howling from the left. However, a DoLive Shad was chunky enough to cast and remain in contact with so I asked Josh to use one of these while Mark attached a Bait Breath TT Shad with a belly weight/weedless hook combo onto the clip. With Adam, I took a different approach and offered him a Tacklehouse Feedshallow 128 (in the Ayu colour)… I’d only said to Adam a few minutes earlier “I reckon you’ll catch the first fish” when I heard a shout “Got one!” erupting from over my shoulder and as I turned I saw the alarming bend in his lure rod. Now Adam had actually landed a Blue Shark from the boat on this set up so a 3 lb wrasse wasn’t exactly going to pull him in! But it put up a remarkable scrap and stayed deep (in the 3ft of water in front of us) to the extent that I didn’t know if it was a bass or a wrasse until it surfaced ready for the net- it’s camouflage was really impressive! It was while Adam was playing the fish that I could hear Henry over the radio… “What is it? “Oh **** I’ve done my calf again!!…. Put it in a rock-pool” Oh ******hell….” A few minutes passed (in which time I’d removed the lure and taken a couple of photographs myself and placed the wrasse in the coolest pool I could find) before Henry reached us. Poor bloke – he was gutted that such an innocuous jump from one rock to another had ruined his day. From that moment on, he could hardly walk. He felt terrible and following half a mile of stumbling, expletives and laughing he decided to call it a day. He kept apologising to us, but we really did feel for him, and as I said to him later on the phone, the guys were over the Moon that he’d come along. The only negatives were obviously his calf (limiting his fishing/photography for a while) and the fact that he later missed Adam catching a couple of bass – If you’re reading this Henry, thanks again for coming up and I heal up soon mate! After another 45 minutes or so, it was time to move before we were cut off. This time, a much deeper venue (8 – 10 ft) where the tide speeds up between a couple of ‘islands’ and the main area of rock. 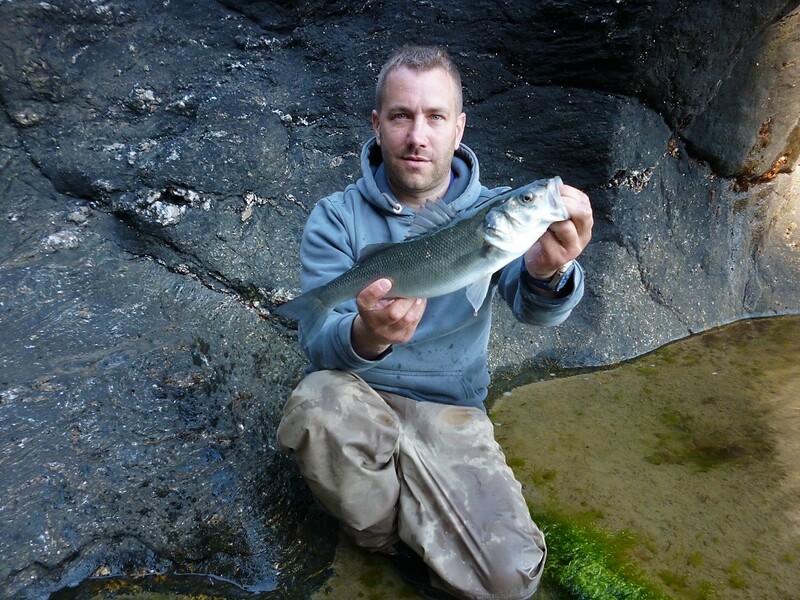 Again, there are a number of fishing platforms available, but I was very keen to try to find some ‘white water’ to really maximise my clients’ chances of a bass – which was what we really wanted to catch. So with Mark positioned, content and casting his Xorus Frosty II into the current I asked Josh and Adam to follow me around a secluded cove so that they could fish an area that was facing the very strong easterly wind. By now, the tide was almost 5 hours into the flood and the waves/swell had built up to around 3 – 4 ft creating some decent conditions with white water bubbling around the rocks. Onto Josh’s clip I attached a 12.5cm Savage Gear Sandeel and onto Adam’s went a Savage Gear Pencil Prey 115 (see below). It was about 20 minutes later when Adam’s rod hooped over – the bass had taken the lure right at his feet (a very common occurrence in these kind of conditions). With the waves breaking onto his platform it wasn’t completely straight forward netting his fish but with a bit of adjustment and a splash in the face for me, the bass was captured. It wasn’t huge, but it was very welcome and certainly worth the grief he received from his mate Josh! The tiny (10 yards across) secluded cove that we’d rounded earlier was full of rotten weed (maggots/sandhoppers/lice etc.) that was being disturbed by the building spring tide and waves… To me that spelt two things – mullet and bass! So there I am, crawling along a ledge a couple of feet above the water, but only 2 metres out from the dry shingle when I spot them – 2 bass, both in the 3 lb range – nowhere near as large as the ones I’d spotted nearby a few days previously but nice bass all the same. The trick was to try and catch one! With Mark now crouched down next to me, he gently lobbed a weedless Bait Breath TT Shad out about 5 yards and started the slow retrieve – a firm KNOCK and a PULL but the fish failed to hook up… Gutted. Quite often you only get one chance before the fish are spooked and despite seeing one other bass, again really close in, it wasn’t to be – but it was a very exciting way to lure fish. Mark eventually managed two wrasse from further out in the cove which although weren’t the intended target species, he was really happy about. By the time we had walked to the next mark the sun was lowering in the sky and the tide was just beginning to ebb. With only an hour of the session to go I positioned Mark on the shingle beach (that runs onto a lovely reef) and instructed him to search the area out with the TT Shad – casting, retrieving and then moving a few yards. With more floating and rotting weed present, a 7″ Slug-Go in the Arkansas Shiner colour (launce imitation) was flicked out and gently twitched back towards the shoreline for Josh. These are fantastic and very realistic lures that simply slide through any ‘crap’ in the water – a weapon to have in your lure box that’s for sure. For Adam, we recommenced with Tacklehouse Feedshallow searching out the gullies between the rocks searching out any bass that might be ‘holding’ in the area. Another 40 minutes passed and with lots of small mullet moving into the area (sucking up the maggots on the surface) I was willing a beast of a bass to appear! Another time maybe… We were all shattered to be honest and by the time I called ‘time’ the heat of the day and sea air was hittng home despite breaks in the shade, lots of fluids and pitstops. We’d had a great laugh together, my clients had enjoyed their day and we’d caught bass in conditions not overly conducive to doing so. A very sunny and windy day – a great place to be enjoying it! Here’s to next time! Thanks for reading. Next Guided Bass Fishing – Night time needle lures a PB!